"Once more into the frey..."
International terrorists have proven no match for Liam Neeson in Taken, nor have shadowy assassins in Unknown. 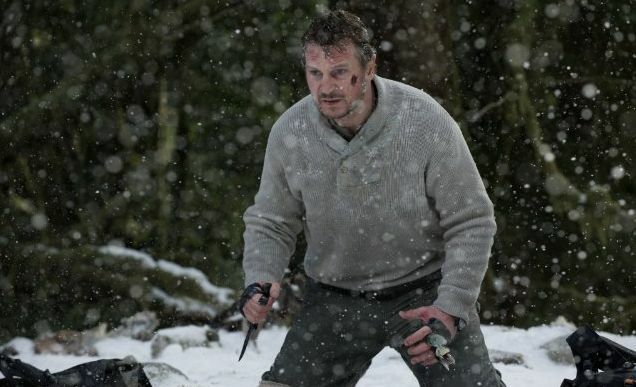 In The Grey, Neeson battles Mother Nature herself, and her agents, killer Alaskan wolves. A somber, suicidal paid assassin for an Alaskan oil drilling company, Neeson's primary function in life is to shoot the wolves that threaten their digs while silently yearning in heartbreak for his lost wife. When a horrific plane crash strands him and several other oil riggers in the frozen northern Alaskan wilderness, Neeson's (limited) survival knowledge is the only thing keeping the survivors alive as wolves pick them off one by one. The plane crash sequence in The Grey is as white-knuckle inducing as it gets, though the odds of so many men walking away from such a crash relatively intact is the first of many pulls against the fierce verisimilitude The Grey belabors. (Most of the survivors are bitten by wolves but manage to shake off the pain for as long as the screenplay requires.) Besides Neeson, Dermot Mulroney is the only other name actor in the cast, but the standout is Frank Grillo (who was Joel Edgerton's trainer in the equally manly Warrior). Grillo starts off as an arrogant antagonist feigning bravery where there is none but undergoes an emotional transformation in the crucible of their dilemma. His final moments of surrender to the hopelessness of their predicament are heartbreaking. The wolves, fearsome opponents that they are for the survivors, are real pros -- they read the screenplay and knew exactly when to attack for maximum shock and carnage and when to hang back to give Neeson and the cast ample time for male bonding and brief but effective character studies. The wolves also deserve credit for eschewing movie cliches and not killing the lone black guy first. Neeson is in top form, admirably holding it all together despite being "scared shitless" and doing his best to find a way to lead his shrinking party to some kind of safety. Particularly fascinating is the fact that Neeson's decision-making is faulty; his strategy of leading the men towards the forest in hopes of avoiding the wolves' den ended up accomplishing the exact opposite result. Director Joe Carnanhan (The A-Team) paints a bleak, harrowing portrait of Man enduring against the insurmountable fury of both Mother Nature and Man's inner nature. The Grey's effect lingers long after the final, iconic image of Neeson, armed with a blade and a fist of glass shards ready to face the Alpha Wolf mano e wolfo for all the marbles, fades to black.